Happy New Year everyone! I'm celebrating another year by opening Infinium Ale brewed by Boston Beer's Samuel Adams in Boston, Massachusetts and Hammondsport, New York. Beautiful presentation in its odd-shaped, wine-sized bottle. 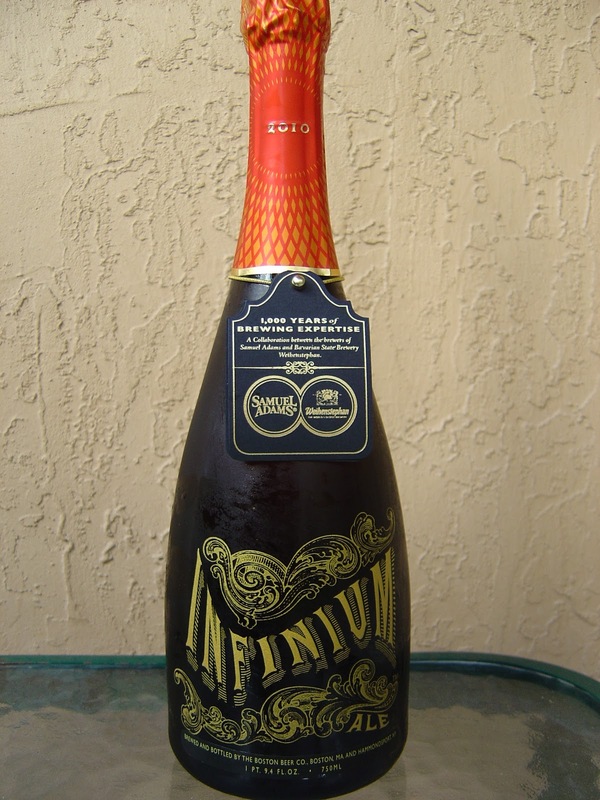 The cork and cage were covered by an orange and gold foil noting its 2010 vintage. 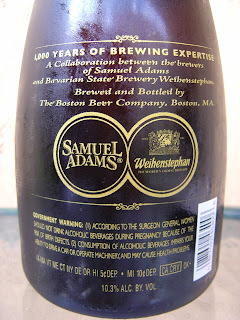 Finally, a tag adds a nice twist and talks about this beer being a collaboration between the brewers at Samuel Adams and Bavarian State Brewery Weihenstephan, with 1000 years of brewing expertise (you know who has most of those). The tag further brags about adhering to German beer purity law Reinheitsgebot, where only malt, hops, water and yeast are permitted ingredients. Serve between 40-42 degrees F and before July 2011. Big cork pop, and a big fluffy white head. Lemony citrus and fruity apple aroma, a little spicy too. Nice flavors to start as well. Light fruity apple and pear and, yes, grapes. Great yeast texture and character as well. The 10.3% alcohol is a definite contributor and really does a nice job enhancing the fruits. Definitely like a sweet champagne, dolce if you like. Extremely creamy with awesome prickly carbonation dancing in your mouth. 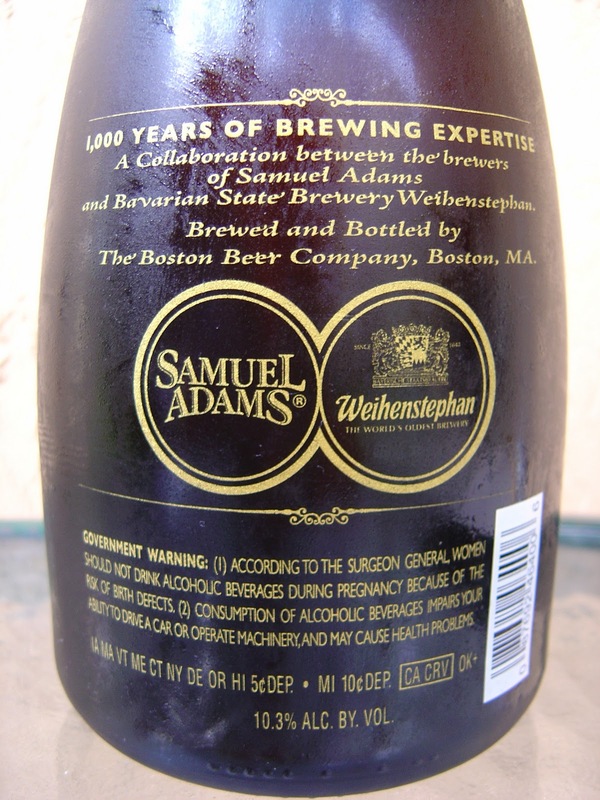 You will taste some spiciness toward the end as well, another component to a complex beer. I thought there might be quite a bit of funky yeasty flavors in this beer, but while I did notice a little, nothing very pronounced. 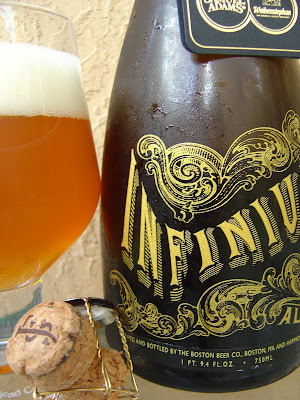 Infinium has a slightly syrupy consistency, but the alcohol again does a decent job of combating that. Still, this beer remains on the sweeter end, which was fine; however, I'd have definitely preferred to have a little more tart or bittering citrus balance. 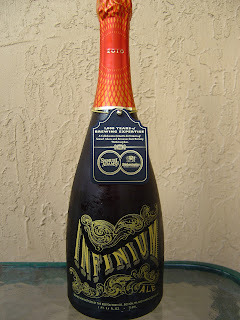 On a final note, this beer was $20 so I may or may not opt for it again at that price point, even though I did enjoy it. For $20, I thought it was a fair investment for New Year's Eve, especially since I can drink a whole bomber of beer but not champagne. My wife didn't like it and let me finish her glass. Win! That happens with my wife too when I try to include her. I also consider it a win for me. Excellent planning and strategy, Joel. I had zero beer yesterday, unfortunately. Even my review was canned from a few days earlier. But the Johnny Walker was just fine. :) Happy New Year! My review of this stuff will be posted on Wednesday. I agreed with every point you made with the exception of the syrupy comment. I thought it wasn't bad given it was 10% ABV and sweet. As Joel said, a decent investment for a special occasion.